Are you looking to buy your first home or to invest in real estate? Do you need a reliable broker to list and sell properties on behalf of your asset management or mortgage default servicing company? If you answered “yes” to either of these questions, then we can help you! We know that in today’s market, it is imperative that you choose an REO broker with experience and a thorough knowledge of the marketplace. When you choose PA-REO, Inc., you're choosing a broker with over 18 years of REO experience in the Philadelphia metro and southern New Jersey areas. With an average of 190 closings per year for the past 10 years, you are also choosing a company that works hard to ensure competent closings. We offer a wide variety of real estate services from starter homes to investment properties, lender services, and everything in between. 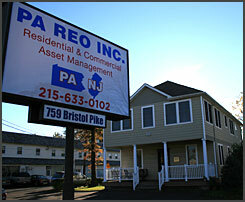 Our team of “homegrown” professionals are ready to assist you—we all live within PA-REO, Inc.’s coverage area. Thank you for visiting our website and if we can be of service, please call us today!